A court has said a terminally-ill 14-year-old girl could have her body cryogenically preserved in the hope she could later be brought back to life. What do people who make this choice expect? "I know it is a very slim chance, but however long you live is never long enough," says Chrissie de Rivaz, from Cornwall, of the prospect that technology may one day be able to revive her lifeless body. 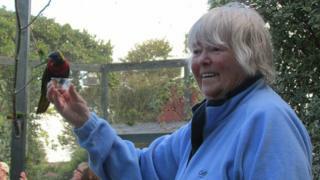 She has saved up the £28,000 to be preserved when she dies, as has her husband John. Added to the additional costs to fly them to the US after their deaths, the total is close to £65,000. "But then he sent me literature, I read it through and I thought it is not quite so horrible after all. In fact they are very caring with their patients. That was about 25 years ago and I have been signed up ever since." Mrs de Rivaz does not want to persuade anyone else to do it and believes it is a personal choice, but one she wants to take. "I have three sons and they do think we are bonkers," Mrs de Rivaz said. "But they are very supportive and know it is what we want to do. It has to be your decision and they know that." Cryogenic preservation: How does it work? "Hopefully they will be able to bring John back too or I won't know anybody," says Mrs de Rivaz. "But if not, I think I will survive on interest. "I think of how much we love looking back at history and archaeology. I think the interest in the future will be even stronger. "I hope to live for a lot longer as I am, but there is that chance if I take this choice." Tim Gibson is another Briton set on being preserved after he dies. "I have wanted to do it since I heard the story about Walt Disney doing it," he said. "I later found out that wasn't true, but then I saw a documentary when I was about 19 and thought, 'That is fabulous, I want that to happen with me.'" He is a committee member of Cryonics UK, an organisation which aims to provide assistance to those "who wish for their body to be cryopreserved upon 'death'" - and adds that the inverted commas round "death" are intentional. By the time he turned 20, Mr Gibson had discovered you could pay for the procedure through life insurance and was signed up before his 21st birthday. However, unlike Mrs de Rivaz, he will not be having his whole body preserved after his death. "Originally I wanted that, but I had a few issues with my insurance and now I have gone for neurological freezing, where they only freeze your head," he said. "When they get to the stage they can build you a whole new body, all they need is the brain and the DNA. "I know it starts to seem wacky then, but think about it. If they have all the data there, then they just need to transfer it." Mr Gibson, who is now 46 and lives in Sheffield, is not just a signed-up member for his own future, but helps prepare bodies so they can be transferred to the US. The team likes to be there before the death so it can get to work as soon as possible, including keeping the heart pumping so the brain continues to get oxygen and slowly cooling down the body before it goes into surgery to have blood drained and replaced with chemicals. Mr Gibson does not have a medical background, but has completed two week-long courses in the US to be able to carry out the procedure, as well as a number of weekend training sessions in the UK. "The first time it is freaky," he said. "That lasts for two or three times really, but then you harden to it. You really learn by getting your hands dirty and doing it. Now I have done 12 cases, 10 of which were in the UK." So how does he feel about the prospect of waking up in a different time? "It is like going on holiday," said Mr Gibson. "I wasn't born prepared for this life I am in, I was brought up in the house and with the people I live with now. You adjust, you get used to it, and I am sure I will again." Who What Why: How dangerous is liquid nitrogen?